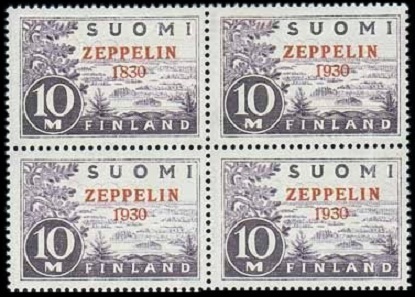 Airmail stamps of Finland were issued between 1930 and 1974, with the first airmail stamp being a special issue for mail carried on the famous German airship "Graf Zeppelin". The overprinted 10 M. denomination pictorial definitive stamp shown above, at the left (Sc. #C1), was issued on September 24, 1930 for mail being carried on the German airship "Graf Zeppelin". 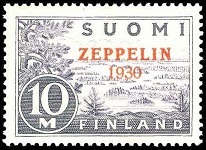 The overprint reads "ZEPPELIN / 1930". These airmail stamps were only valid for letters carried on the Graf Zeppelin's return flight to Germany. The Graf Zeppelin arrived in Helsinki on the afternoon of September 24, 1930. To the dismay of the thousands of spectators, the landing had to be aborted, due to bad weather and gusty winds. 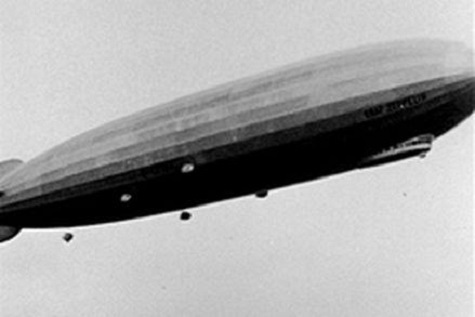 Mail bags were exchanged with the Graf Zeppelin by rope, then the airship and its passengers continued on to Stockholm. 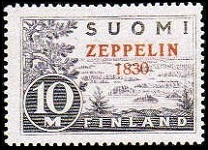 Due to an overprinting error, one stamp in each sheet had the date "1830" instead of "1930". This overprint error, shown above, at the right (Sc. #C1a), resulted in one of the rarest stamps in Finnish philately. Se-tenant combinations, with one stamp having the normal overprint and the other stamp having the error overprint, are highly prized by collectors, though they are rarely encountered in the philatelic marketplace. A block, with the error overprint and three normal overprints, is shown above. 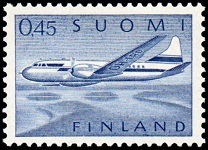 The 3.50 M. denomination commemorative airmail stamp of Finland shown above (Sc. #C2) was issued on March 20, 1944 to celebrate the 20th Anniversary of the Aero Ltd. Air Transport Service in 1923. The design features a Douglas DC-2 in flight, with the inscription "AERO-OY / 1923 / 1943". 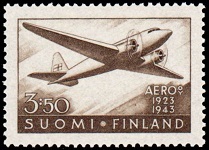 Aero O/Y or Aero Ltd. was founded on November 1, 1923, and it would become the largest airline in Finland. Their first flight was on March 20, 1944. 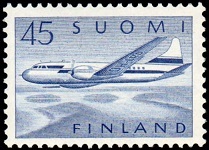 In 1968, the company changed its name to Finnair. Today, it is rated as the third safest airline in the World, and it is the fifth oldest continually operating airline in the World. 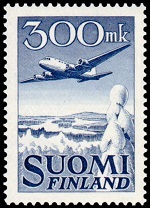 The vertical-format 300 M. denomination airmail stamps of Finland shown above (Sc. #C3-C4) were issued on February 13, 1950 and on January 20, 1958. The designs feature a Douglas DC-6, flying above a Winter landscape. 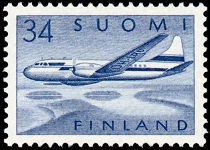 The four horizontal-format airmail stamps of Finland shown above (Sc. #C5-C8) were issued on October 31, 1958, April 5, 1959, November 2, 1959, and February 15, 1963. These designs feature a Convair 440, flying above lakes. The 0,45 M. denomination stamp, shown above, at the bottom right (Sc. #C8), exists on both non-fluorescent and fluorescent paper. The vertical-format 3.00 M. denomination airmail stamp types of 1950 shown above were first issued on October 10, 1963. The common design features a Douglas DC-6, flying above a Winter landscape. There are two types, which are both shown above. Type 1 (Shown above (Sc. #C9a), at the left) - There are 16 lines inside the zeros. Exists on non-fluorescent and white fluorescent paper. Type 2 (Shown above (Sc. #C9), at the right) - There are 13 lines inside the zeros. Exists on non-fluorescent, white fluorescent, and yellow fluorescent paper. These stamps were issued on normal, white fluorescent (bright), and yellow fluorescent papers between 1963 and 1974. Please see the specialized catalogs for details. 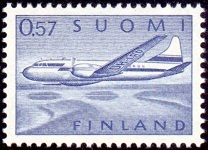 After 1974, separate stamps for airmail postage were no longer required, as the majority of regular mail was already being transported by air by that time. 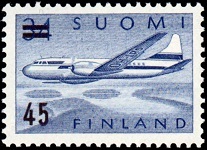 The 57 P. denomination airmail stamp type of 1958-1963 shown above (Sc. #C10) was issued on July 15, 1970.